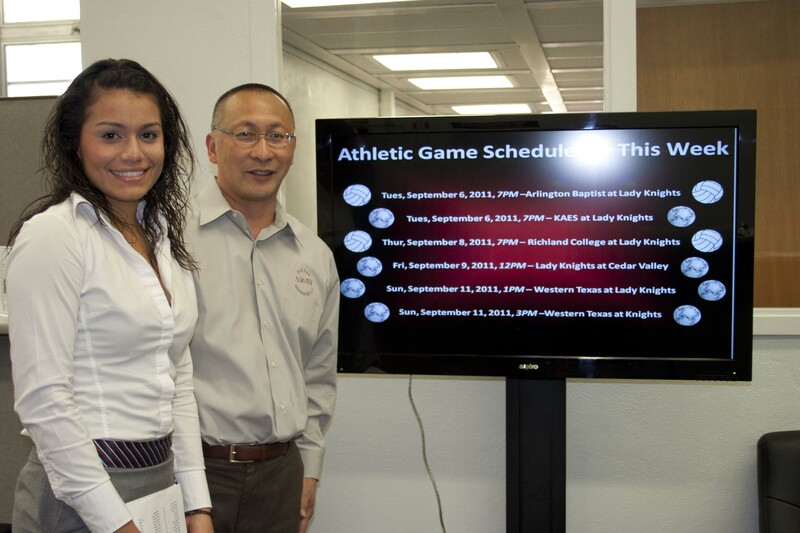 James The stands with student assistant Priscilla Porras by the new monitor in Findley Hall. New monitors have been installed all around the Southwestern Adventist University campus. They are there to help students, staff, and faculty stay informed with campus on-goings, according to James The, vice president for student services. Last year, The felt there was a breach in communication on campus. Students would miss out on events because they were not informed, finding out too late that a social event had come and gone. That’s when Dean The thought it would be a good idea for monitors to be placed around campus. The new monitors are used for making announcements about upcoming events from student association, music and English department programs, spiritual development, team sports, intramurals and more. Dean The says “the goal for our new monitors is to keep the University campus informed.” Monitors have been installed in Harmon Hall, Miller Hall, Findley Hall, the Chan Shun Centennial Library, Leiske-Pultar Gymnasium, Pechero Hall, and soon in Hagan Hall. Students are still encouraged to check their Southwestern email account daily for announcements. If people would like to make an announcement on the monitors, they need to make a Powerpoint slide of the information and email it to Dean The at jthe@swau.edu.